Rhodes Lindos East coast private tour with our professional experienced drivers gives you the best experience and day tour available on Rhodes. Live the legend of the Colossus of Rhodes and visit the site of one of the 7 wonders of the ancient world. 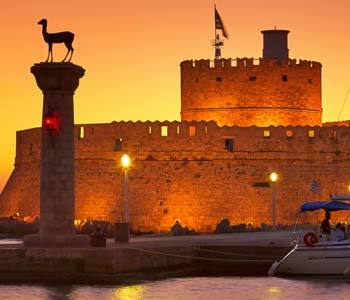 Explore the medieval city which is Rhodes ‘Old Town’ , a living and breathing UNESCO site. As you leave the old town you will pass through the new and onto the ancient stadium and Acropolis of Rhodes which is situated atop the highest part of the city. After enjoying the views we journey on to Lindos, 35 miles down the east coast. Additional fee for lunch and entrance fees to sites. Additional hours can be added. Extend Your Tour: If you wish to take longer at one particular site or stop for lunch or a swim at one of the island beaches you may extend your tour at the time of booking or on the day with the driver. Additional time is charged per hour. Tour also available for larger groups with private bus contact us for details and prices.